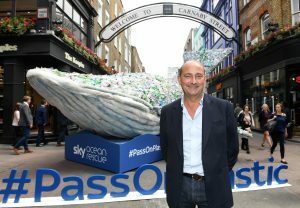 Shaftesbury, Project 0 and Sky Ocean Rescue announce the launch of Pass on Plastic, an exclusive and exciting pop up ocean experience will open at 20 Beak Street in London’s world-famous Carnaby area. Open between 8–24 June, the creatively driven project aims to raise awareness for ocean conservation. Shaftesbury, owners of Carnaby, have donated the space as part of their sustainability program. 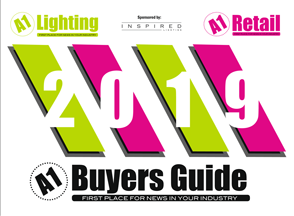 This follows their recent installation of a public water drinking station in Kingly Court, Carnaby’s F&B emporium, to encourage visitors to the area to fill their reusable water bottles. 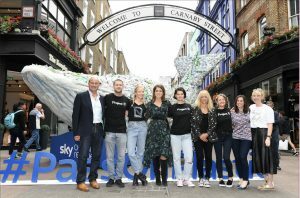 Launching on World Oceans Day, 8 June, the pop-up from Project 0 and Sky Ocean Rescue, leading ocean conservation organisations, aims to inspire people to eliminate single use plastics and show how everyone can easily change their consumer habits. The creative hub will feature art, music, film, performances, inspiring talks as well as guest appearances by a few famous faces. Pass on Plastic has collaborated with some of the world’s most influential artists and culture makers to create unique a range of organic T-shirts called ‘Salt-T’ by the likes of Ronnie Wood, Alice Temperley, Pixie Geldof, Fearne Cotton, Slash, Lily Donaldson, Henry Holland, Tracey Emin, and Leah Wood, prices from £29.95 with exclusive prints available to buy in the pop up. Limited edition canvas tote bags will also be available to buy in the store from £25 with all proceeds going to towards protecting the oceans. 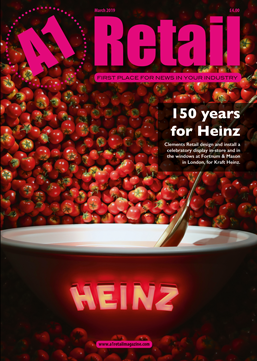 Artists Paul Karslake and Tess Felix will be displaying ‘rubbish’ art, and Brazilian-Armenian jewelry designer Ara Vartanian will sell his beautiful shark ring. Project 0 ambassadors and friends will also support the pop-up with surprise DJ sets and live music sessions throughout the exhibit including La Roux, Nick Grimshaw, Raff Law and singer Bernard Fowler (The Rolling Stones) who will be on hand to sign copies of his record The Bura. The Pass on Plastic Experience will also feature upcycled surfboards featuring the work of popular London street artists including Annu Kilpelanien, David Shillinglaw, Lily Mixe, Paul Insect, and Pure Evil; and stunning artwork will be on display, including artist Kristjana S. Williams. The pop-up will include many other surprises over the course of two weeks, including a beautiful Instagramable ocean mural.